How to add live chat to your website free? Are you seeking a FREE chat support software for your site?Try Chat4Support, which is a full featured, simple to use, easy to install, FREE website chat software for you to embed and use on your own personal or business websites, online stores, or anywhere else you can copy and paste HTML code that we supply. Our free chat software for website can help you sell your products on line and supply realtime support and customer services by live chatting with your customers or visitors online. In additon, Chat4Support is also a great visitor tracking solution, which enables you to monitor site traffic, and analyze visitors' web activities, including their search engine and keyword usage. * From which websites or search engines are your customers coming to your site. Still not convinced with all these features? Go to Download for full featured livechat software free trial version. How to get a free real time chat system for my website? Step 1 Download Chat4Support client software from Download page. Chat4Support is a great free online chat for websites. You can live chat with your website customers free! (Besides a free version, there are Lite, Standard and Professional editions with more powerful features in our live support, visitor monitoring and customer service). You can try the software first before uphrading to the paid versions. We offer a 5-day trial with all full features, enjoy! By placing free website chat applets on your website you will benefit from real-time feedback from your site visitors about your products and services, or your web content. For websites that sell services or products, a web chat program will definitely help you communicate with your leads in real-time and make more sales. If chatting online via your web site is an entertaining and engaging experience for your visitors, these users will often return to your site, driving repeat traffic. This type of web content is often shared via social bookmarking and other social networking sites. If you want to make your site livelier, grab more visitors' attention, and boost your traffic, then adding our free online chat software for your website is perhaps one of the more effective solutions for increasing user engagement and growing your online community. With Chat4Support you can live chat with visitors on your web site to increase conversion and online sales! Don't miss out on the many potential benefits to your website by the addition of a free website chat software from Chat4Support.com.Talk to your website visitors from your PC, or mobile phones. Increase sales and improve customer service. Start right now! Want to get free live chat to your website? Chat4Support provides strong features about live chat.Why?If you are running e-commerce business,live chat on website is very useful and dependable for you.Multiple features of Chat4Support will surely meet your needs. Your visitors can chat with operators on line by clicking the chat button,easy and time saving .Under this way,visitors can get instant reply and gain more inforamtion. With Chat4Support,you can view the visitors footprint and information,besides,you can identify and catch potential visitors with keyword match. When you use SSL(Secure Sockets Layer),your conversation with visitors can be encrypted so no one can intercept your important dialog. Visitors can leave message in the system even though the operators are off-line an choose a department to reply to them. Chat4Support lets you bidirectional transfer files.Both visitors and operators can send files,this feature can increase live chat quality and imporve efficiency. How to add Chat4Support to your webpage? Do you want to create a live chat on your website for customers? Please try Chat4Support , which lets you build live chat software to your website. It is the best free livesupport and website visitor monitoring software that helps you attract more customers to increase your sales indeed. Set up Chat4Support website chat software now and give your web visitors the ability to chat, talk, and connect with you right from your website. How to Set up Chat4Support on your website? Once you set up Chat4Support, you can enjoy the 5-day trial with full professional features. Chat live with your customer on one to one basis and solve their queries at the point of their buying interest. This helps in closing sales faster. Live support brings more confidence to your customers. Track how many visitors on your web site on which web page they are. How long they are on your web site. Analyze where they come from and their search keywords usage. A chat program for extensive details for visitors. Make web site live and interactive, offer best customer care services, support them when they need. Help multiple customers at the same time, use canned responses and push web pages, which reduces cost and improves response time. If you are looking for online live chat downloadable software for ecommerce websites, please go to download Chat4Support and have a free trial experience. Through Chat4Support you can communicate with your website visitors to turn them into loyal customers. You can efficiently collaborate with the customers to know what they expect from your products and services. Get Started to try Chat4Support right now! Do you know how to make a live chat and get traffic to your website quickly? Are you thinking about setting up an online visitors chat solution? With Chat4Support online customer support widget, all of this is possible. Chat4Support -- Free Live Chat Software, Visitor Tracking, and Support Ticket Solution. No matter you are a webmaster, online store owner, e-business manager, customer support person, or online sales representative,you would like to add chat software for your website to talk with your visitor real-time. A cost-effective or free desktop live help software will be very useful for you to have a live help chat with website visitors. Free support chat solution is a necessary for your online business. If you are a website designer looking for online business chat widget for website, ChatSupport will be your top option. Chat4Support is one of the best online help webmaster tools to build a interactive web site. Live chat to likeminded people about music, gardening, pets and more. Ideal for virtual business meetings, and staying in touch with colleagues wherever you are. Add a personal touch to your site and connect with your customers. Create the perfect venue for visitors looking for love and companionship. If you need a free one to one instant chat widget with more features, please try Chat4Support, which lets you to add live chat on your website. Go to download from http://www.chat4support.com/Download.asp and enjoy the 5-day professional free trial! As a webmaster, it is of vital importance to monitor your website traffic. You have to know where your website visitors come from, what pages they are viewing and how long they stay. This can let you know which pages/articles on your web are working and which are not. Based on it, you can more easily understand your potential customers' needs and figure out how to improve your website. All these can help you significantly increase your revenue. Chat4Support is asp.net live support chat software with monitoring feature, which can make you analyze visitor tracking and improve online marketing performance. It combines the features of live chat support and website traffic monitoring, which gives you a chance to find more potential customers and greatly increase sales and website revenue. Chat4Support has strong features. In addition to live chat and website traffic monitoring, it also supports Skype to call visitors, customization, chat history checking, ect. If you want to know more, please take a look at Chat4Support Product Features Page. If you are searching for free live chat systems which can monitor website visitors, please free download Chat4Support on the Download Page. Even though it is not an open source live chat for website, it provides with Free Edition, which is gratis support chat program. After you download it, you will have 5-day free trial with full professional features, and after 5 days, it will automatically turn to the Free Version with 30 days free use. Please go ahead to have a free trial experience. After 30-day free trial, you can go to the BuyNow Page to upgrade the Free Version to Lite/Standard/Professional Version. Chat4support is the cheapest live chat software in comparision with others. Please go to the Edition Comparison Page to view the version differences and then find out which version is the most suitable one for you. Chat4Support is also a live support program for website with multilingual, which includes English, Chinese, Polish, Turkish, Hungarian, Russian, Japanese, Spanish, Portuguese, ect. It meets the need of people who speak different languages. As to the customer service, we offer live chat support and email-support to help you solve the problems which occur when you using our live help app. For more information, please enter the Home Page. Do you want to set up a free online chat support program for your website in order to improve your customer service and increase your sales? If yes, Chat4Support should be your option. It is a instant messenger for your website to let you chat with your web visitors in real-time and turn them into your customers. Chat4Support is feature-rich, fully-customizable and click-to-call free download chat software, which helps add live support chat program for your website free and may be the one that brings tremendous value and ROI to you. * Based on Delphi and Asp.net language. Chat4Support is a fast and reliable online support chat tool via website. It is a free asp.net support chat for 35-day free trial experience. (We offer free trial use for 5 days, which has full professional features. After 5 days, it will turn to the free version automatically, which can be used for 30 days). If you are looking for a powerful free website chat program, please download Chat4Support for free trial experience, which is free live chat for your (ecommerce) site that provides live online support for customers. Live support brings more confidence to your customers. Chat4Support can help you sell your products on line and supply realtime support and customer services by live chatting with your customers or visitors online. With Chat4Support, you can easily chat live with your customers or visitors on your web site to solve their inquiries and assist them in completing sales process. What makes us Amazed in Chat4Support? * Useful for online store owners and the people who manage E-commerce businesses. * Pre-sale and after-sale service with live support on website. * Monitor your website visitors and traffic real time. * Track visitor keyword usage and discover best keywords for your website. * Expand your website design offering with live website chat. Chat4Support is a value-added live support chatting software for your customers' websites. Are you looking for a multi-functional product to live chat and track visitors? Chat4support is a quite good choice for you. Chat4support realizes to live chat with website visitors, monitor site traffic, and analyze visitors' web activities, including their search engine and keyword usage. Using C4S, you can analyze how many visitors are browsing the website, or what keywords using frequently, or how long they stay on the webpage. 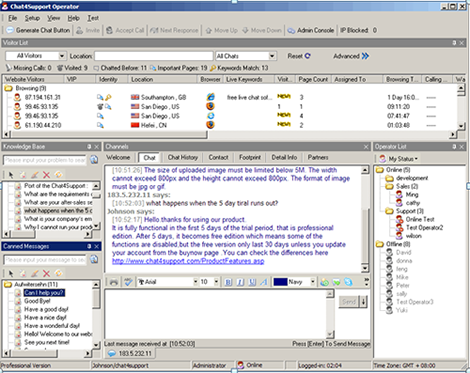 When browsing the company’s website, visitors do not need to install any software to have real-time dialogue with the operator. Go and check our website: http://www.chat4support.com/. Choosing utility online customer software, as well as employs a helpful secretary for you. Compare to the other online customer service software, chat4support prefer to let users to show their own individuation, and make to order according to their needs. When selecting C4S, you can demonstrate your latest products, including the information of it and what functions it has. In the meanwhile, you can offer the excellence online service that the clients need, to solve their problems in good time. That is one of the effective methods to attract clients while having sales on the internet. If you are interested in our product, please go to this website: http://www.chat4support.com/. You may find some online chat softwares nowadays do not help to observe how many visitors browsing your website, or when is the peak time of browsing during a whole day. Chat4support has strong features on this matter. When a visitor browses your website more than once or browses an important page, you can immediately identify this visitor; also, you can find that if the visitor who chatted with you before from your visitor lists. When you log in chat4support, you can see visitors’ information in details, such as their locations, their IP addresses, how they find your website via which keywords, how long they stay in your webpage, etc,. All these information gives assistance to you to identify visitors and find potential clients. More information please clicks to http://www.chat4support.com/ . What benefit can we gain from Chat4support? How can we know that whether online customer service software is good or bad? Or, how can we benefit when using Chat4supportw? It may contain the following four points. Firstly, it can increase sales and web site revenue. Through Chat4Support, you can find that your customers or potential customers who are likely to purchase your products and enjoy your services. Secondly, it can reduce customer support and sales costs. Chat4Support runs through internet, and offers live help to contact with your clients or visitors via online chatting. Thirdly, it can analyze visitor tracking and improve online marketing performance. Chat4Support can make you monitor your website tracking and visitor browsing, then improve your website tracking and the marketing services for your customers by needed statistics and analysis. Chat4support give you confidence to win! Chat4support’s powerful management tools give you the confidence you need to create the experience you want. You can upload customized chat buttons or create your own design and use them for both online and offline buttons. Including the invitation window background, the company logo, and invitation title, notice message, chat welcome message and site bar image, all these you can design according to your own idea. With real-time moderation controls, customized real-time content filters and IP-based blocking, Chat4support’s moderation features are second-to-none.